Knowing how to tie a necktie is a useful skill for both men and women. There are actually several different necktie knot styles, each of which has it's advantages. Depending on how you pick a necktie and the type of event you'll be attending, one of them will be perfect for you. Luckily, with the right instructions and a little practice, you can master any type of knot. This knot is very traditional, and it's easiest to use it with thicker fabric ties. It causes a wide, symmetrical triangle that lends an air of confidence to the wearer. This is the type of tie you'll often see on politicians, business leaders, and other officials. It's a great choice for any formal or semi-formal event. Lay the tie across the back of your neck, allowing the ends to hang down in front. The wider end of the tie should be on your right. Adjust the tie so that the wider end hangs down about a foot more than the narrower end. Grasp the wider end and pull it across the narrow end. Bring it back up under the narrow end and pull it through to create a loose knot. Bring the wide end down beneath the narrow end and bring it up over the knot you made in step four. Bring the wide end across again and pull it up behind the knot. Tuck the wide end into the front of the knot, between the layers. Adjust the knot to give the tie the appropriate fit. This instruction video for the Windsor knot moves slowly enough that you can follow along as you practice. Try it a couple of times before any big event so you can be prepared to tie your tie perfectly. The half Windsor knot is quicker to create. It produces a thinner knot than the full Windsor, and does not convey quite as much style. 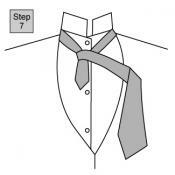 It is tied in much the same way as the full Windsor, but you can skip a few steps. This makes it a good choice for everyday wear or when you're in a hurry. It's best with lighter weight ties, such as those made of silk. Bring the wide end across the narrow end and pull it up behind the knot. This video from The Art of Manliness offers a helpful view of how to tie a half Windsor knot. You can follow along with each step or pause the video to allow you to catch up. Perhaps the most popular method of tying a tie, the four-in-hand knot is simple and easy for beginners. It's also known as the "schoolboy knot," because it's one of the first knots boys learn how to do when first wearing a tie. Although it doesn't have the sophisticated look of the Windsor knot, it's a good choice if you're looking for something quick. Bring the wider end behind the narrow end and then wrap it over again. Pull the wide end up behind the crossed part of the tie. Tuck the wide end so it's just behind the first layer of the crossed part of the knot and pull it down through. Adjust the knot to get the appropriate look and fit. This helpful video can walk you through the steps of tying a four-in-hand knot. It moves slowly enough that you can work with your tie as you watch. A bow tie is a different shape than a traditional necktie, and it has its own rules for tying. You may wear a bow tie to a very formal event, such as a wedding or gala. Avoid clip-on bow ties whenever possible, since the real thing has a far more sophisticated look. Lift up your collar, and drape the bow tie across the back of your neck with the ends hanging down in front. Tug on the right end to make it about an inch longer than the left. 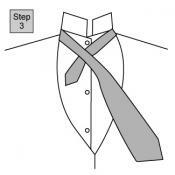 Bring the longer right end over the top of the left end, crossing the tie near the neck. Grasp the crossed part with your fingers. Bring the long end up behind the crossed part to create a knot. Take the short end and form it into a loop, or one side of the bow. Fold the bow forward and lightly pinch it against the end with your fingers. Bring the long end over the center part where you're pinching the bow. Form the long end into the other part of the bow. Tuck this side of the bow into the knot you made earlier and adjust to get a nice fit and appearance. Use this video to practice tying a bow tie. It's made without hands, so you can see exactly what you're supposed to be doing for each step. 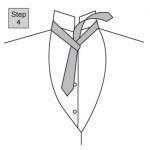 It's easiest to tie a necktie with the shirt collar collar up. 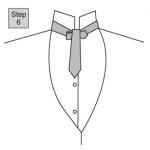 Always wear your tie under your shirt's collar, which should be turned down once you are finished tying your tie. The proper length of the final knotted tie should have the wider end just barely above the top of your belt. The wider end of your necktie should completely cover the narrow end. Keep your ties nice by undoing them in reverse, rather than pulling out the knot with a yank. Even the best silk will wear out with poor use. No matter which type of knot you choose, it's important to know how to tie a necktie. This skill will come in handy for job interviews, social functions, and other important events. Take your time to learn a couple of methods, so you'll be prepared for anything.